Lydia Minatoya’s memoir, TALKING TO HIGH MONKS IN THE SNOW, won numerous awards, including the PEN American Center’s Jerard Fund Award for an emerging woman author, the Pacific Northwest Booksellers’ Award, and notable-book citations from the American Library Association and the New York Public Library. 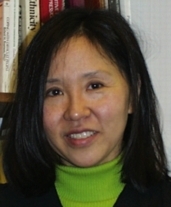 Ms. Minatoya was born in Albany, New York. After earning a doctorate in counseling and psychology from the University of Maryland, she spent two years teaching at universities in Japan and China. She now lives in Seattle with her husband and two young children. THE STRANGENESS OF BEAUTY is her first novel. Dennis Y. Ginoza recently spoke with Ms. Minatoya at her Seattle office. Ms. Minatoya’s answers are presented here in RealMedia 5.0 format (non-streaming). To listen to these files, you will need the free RealPlayer software.